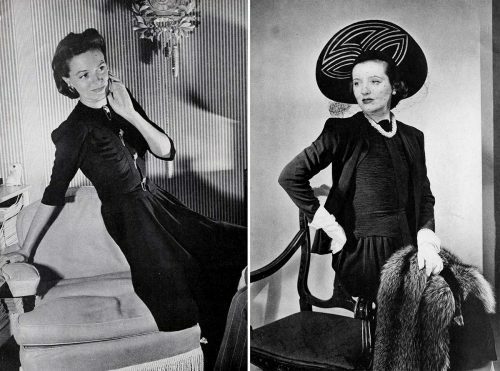 Glamourdaze reviews some Winter Dresses and Coats in 1940 . Also some vintage inspired wardrobe ideas for the young fashionable 1940s woman. This winter you will look feminine and fascinating. A body that is supple and slim. From head to toe you will be consistent. Hair will be brushed up from your forehead in a gleaming pompadour. Hats will be large, bold, dramatic. Your dresses will be slim. 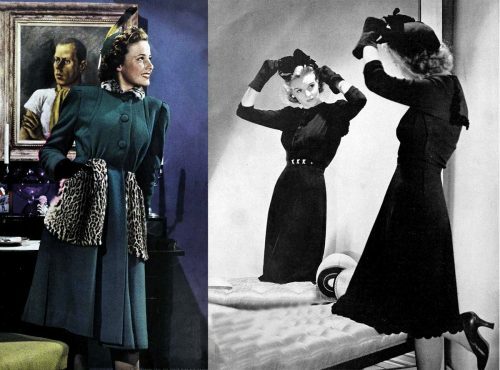 Left: A young American Modern herself, movie star Laraine Day wears this gay Botany all-wool coat in a tingling frost green, with a little collar and great swaggering pockets of ocelot – the Fur of the season. Right: For Afternoons – a rayon crepe frock, velvet rosettes outlining the sailor collar and hem. A pretty rhinestone trimmed belt. Perfect for that ‘meet you at about 4pm outfit. The crisp winter air will find you walking briskly, but with prim little steps, fully aware of your newly narrow skirt. Your suit will be snug, fur trimmed and with a jacket that comes way down over your hips to button tightly, smoothly. Left: Try a black rayon crepe afternoon dress. It has an expensive look. A lot of fashion for a little price. It’s gay gilded birds which snap on the bodice as buttons, to the molded, lowered waistline releasing a flutter of unpressed pleats. Fashion, too, in the bodice, softly pleated down each side. Right: Her cocktail suit of rayon crepe has”bi-placket” adjustment on the dress. Fashion importance in the crushed pleating, which, as you can see, is a deceiver. Achieve a slim line under your winter outfits with the correct foundation wear. The Gossard Line of Beauty is our recommended brand for girdle and bra combinations, giving you the perfect silhouette for this winter fashions. Left: Pretty pouch pockets on a slim dress. Smooth surplice bodice, bracelet length sleeves. Middle: A smart princess coat is the perfect foil for fur accessories. Right: New shirt-waist frock with contrasting blouse front. May have bishop, bracelet or short sleeves. Coat and Skirt, above, of forest green Botany nub-wool, a handsome pair with unlimited uses and a rising star fashion. The fitted coat has a sheared beaver little girl collar. Classic coats and Brewster hats are of warm sturdy Ancuna fleece.